Whether you are looking for the best laptop for music production for; producing/ composing, recording, performing or a combination, we have done the work for you. Generally, laptops are used in these four different applications. For instance, there are those who record tracks from instruments and mics, and then mix - the traditional approach. On the other hand, others like most EDM and hip hop musicians mostly employ sequencers, MIDI keyboard controllers, and DAW to do the whole production. Performing musicians and DJ use a laptop to record, produce and perform. Whatever category you fall into, these music production computers will work for you. ASUS ROG GL703GM features the latest 8th-Gen Intel Core i7-8750H processor. With a 6-core processor, 256GB PCIe SSD and 16 GB RAM, this makes it our top pick for music producers. Its one of the 2 laptops in this list having 6-core processor. The first consideration is your preferred DAW. Is it OS specific? For instance, Logic Pro and GarageBand won’t run on a Window's computer. On the other hand FL Studio won’t run on a Mac, unless the beta version. Your chosen DAW doesn’t just influence the OS but also the specs. 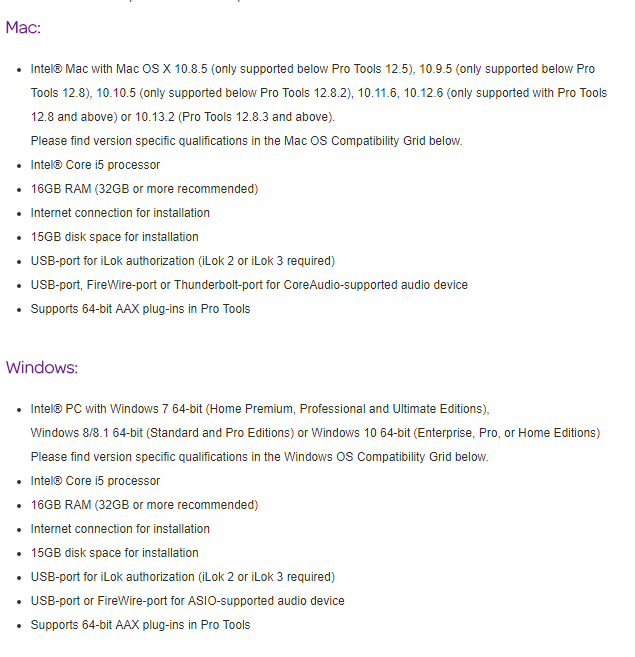 To get the best out of Pro Tools, your laptop should have a minimum of 16 GB RAM and a processor of above Core i5. Secondly, consider the processor. Here consider the frequency. The higher the better. Secondly, how many cores does it have; quadcore, dual core or hexacore? For the best results, go for a laptop with a minimum of quad-core CPU, 8GB RAM, and 2.5 GHz i5 or more intel processor. If you’re not on tight budget target 16 GB of RAM and 3.5 GHZ i7 processor or more. This will allow you to run many audio tracks on Logic Pro or Pro Tools without a hitch. For storage try to get 1TB storage space, with minimum being 500GB. You should also consider investing in an SSD, which we prefer over hard disk as its enhances loading speed of your laptop. GHz (Gigahertz) is the measure of a laptop's clock rate. Which basically refers to how fast a laptop's processor execute tasks. The higher the GHz the faster it is depending on the processor. For instance, 3.46 GHz, Intel Core i5 is not faster than 3.06 GHz Intel Core i7 because they have different processor lines. But 3.46 GHz, Intel Core i7 is faster than 3.06 GHz Intel Core i7. A laptop with Intel’s Turbo Boost Technology is even better. For instance a machine with i5, 2.5GHz processor can get up to 3.0 GHz when running software without overheating. - The screen size - how many tracks will you be monitoring? ZenBook Pro is designed to impress but crafted to perform. This laptop is features packed making it one of our top picks for windows laptops for music producers. 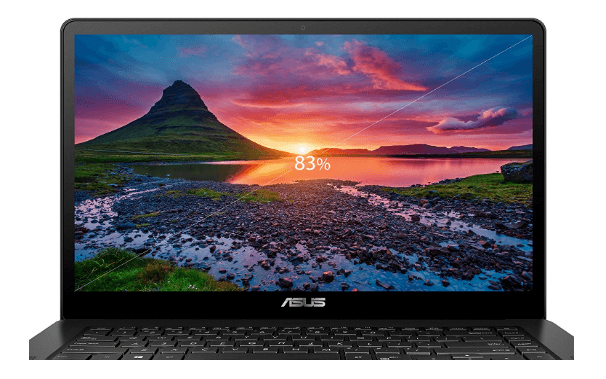 Unlike the ASUS ROG Strix Scar Edition and Dell G5587-7866BLK-PUS, ZenBook Pro’s processor is 7th generation Intel, while the other 2 are features the latest 8th generation processor. But don’t let this rule out this laptop. There are some specs that make it stand out. Another difference between this laptop and ASUS ROG Strix Scar Edition and Dell G5587-7866BLK-PUS, is the number of cores. While the other 2 features 6 cores this one features. It comes with Intel i7-7700HQ Quad Core processor sufficient even for intensive production needs. The based processor speed is 2.8 GHz and can be turbo up to 3.8 GHz. When it comes to memory and storage ZebBook pro takes it. It features 512GB SSD and 16GB DDR4 RAM. However, you can’t upgrade the RAM. From our experience 16 GB RAM is sufficient even for heavy virtual instruments, soft synths, samplers, sequencers, and soft synth users. Primarily this is a gaming laptop so it comes with impressive graphic features. It features NVIDIA GeForce GTX 1050 Ti gaming-grade graphics. So if you’ll be doing video editing or intensive mixing, this is a handy feature. Another feature that makes this laptop stand out is its comprehensive connectivity. It features 2 USB 3.1 Type-C (Gen 2) ports with Thunderbolt, 2 USB 3.0 Gen 1 Type-A ports and a HDMI port. We’ve even come across music producers who say if a laptop does not have a Thunderbolt 3 port, they can buy it. Despite this laptop having 7th generation processor, max RAM upgrade of 16 GB and limited storage, this laptop is great for both beginners and serious music producers. Another release we are so excited about in 2018 is Asus ROG Strix Scar and Hero edition laptops that come with 8th Generation processors. These 4 laptops will be available on Amazon from 16th April 2018 and we can wait to test them. For the best music production experience our pick among the 4 laptops is Asus Rog Strix GL703GM-DS74 model. Why is this laptop a smart option for music producers? 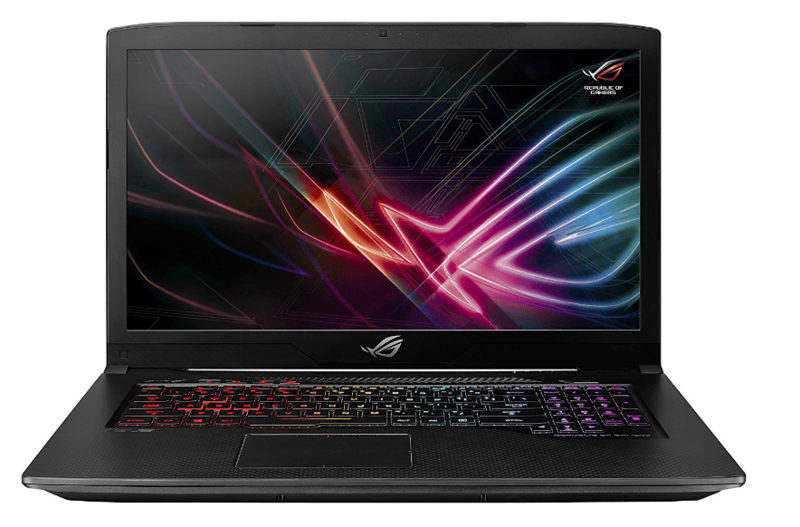 First, Asus Rog Strix GL703GM-DS74 features the latest 8th-Gen Intel Core i7-8750H processor with 9 MB Smart Cache. On top of that this laptop has 6-cores. All along we have been recommending laptops with at least 4 cores and seeing an 6-core i7 processor laptop costing around $1600 is something to celebrate. Processor speed is also a great consideration when shopping for a laptop to make music with. Asus Rog Strix GL703GM-DS74 has base processor speed of 2.2 GHz and go up to 3.9GHz when boosted. This assures you seamless performance even when using heavy DAW software like pro tools or when doing complex editing. One of the distinguishing feature of this laptop from the other 3 laptops with 6-core is the storage. Unlike the other 2 with 128GB PCIe SSD, this one has 256GB PCIe SSD and a 1 TB FireCuda Hybrid Drive. What special about the FireCuda HDD is that it’s made to be 6x faster than the traditional HDD. When it comes to RAM, Asus Rog Strix GL703GM-DS74 has 16GB DDR4 2666MHZ RAM this is a great deal considering that even 8GB RAM laptops can handle extensive music production. 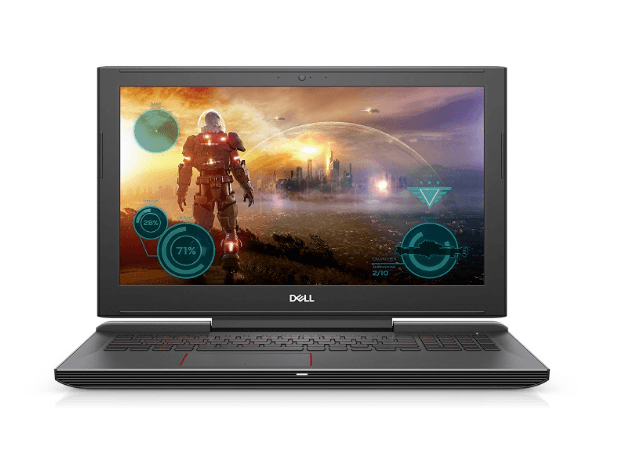 Because this laptop is primarily loved for gamers, the graphics are on point. The NVIDIA GeForce GTX 10-Series 1060 graphics comes in handy during video editing as well as when making music. We also love the Anti-Dust Cooling system that minimizes heating. You’ll also love the RGB keyword which despite being targeted to gamers is a great addition with WASD highlighted keys and N-key rollover. Its wide screen is both an advantage and disadvantage. For instance for a music producer looking for a portable friendly laptop won’t love this, while somebody looking for a bigger screen for editing will love the wide screen. For connectivity, the laptop has 1 USB 3.1 Gen 2 port and 3 USB 3.1 Gen ports, AND 1 USB 2.0. Other I/O includes HDMI and Mini Display Port. Loved for theur stability MacBook Pros are one of the best deals when it comes to music production as many DAWs are optimized for them. 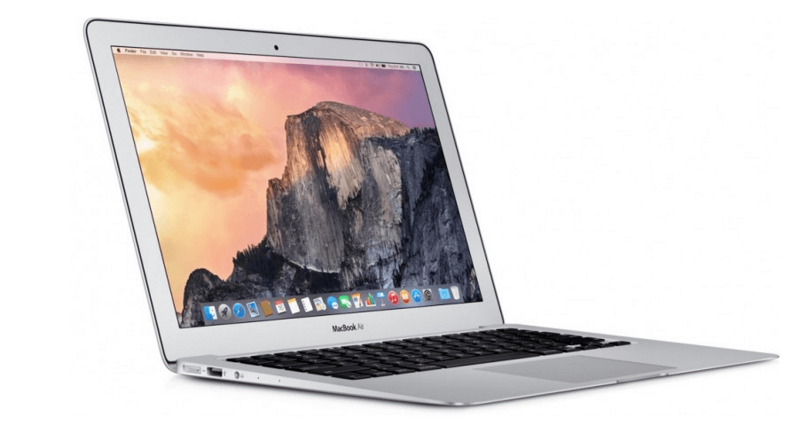 The best MacBook Pro is any with a minimum of 8 GB RAM and a dual-core 3.6 GHz processor. The latest models have a up to 16GB RAM and quad-core 4.0 GHz and stands out for the OLED touch bar. Note; there are almost 10 MacBook Pros options for you from the latest 2017 model to the 2015 models. Like MacBook Air below, MacBook Pro MF839LL has a 13.3’’ screen. However, this one is LED-lit and has a higher resolution of 2560x1600 pixels. It’s, therefore, more superior when it comes to editing. This model also blows the previous model out of water with its larger 2.7GHz Intel Core i5 processor and a Turbo Boost that takes it all the way up to 3.1GHz. One thing we love is the MF839LL’s over 5 million pixels and Intel Iris Graphics 6100 coprocessor that work collaboratively to bring out every detail in your images or videos. MacBook Pro MF839LL again has 8GB LPDDR3 RAM and sports 128GB of flash memory. This music production Apple laptop also shines in the connectivity department. Besides the routine Bluetooth 4.0, HDMI and USB 3.0 ports, you also get 2Thunderbolt ports which allow you transfer files/data up to 4 faster than the most acclaimed USB 3.0 ports. Without forgetting, MacBook Pro MF839LL also boasts 2 mic ports and also has state-of-the-art speakers for music listening, videos, and gaming. We are so excited with this laptop. We can’t believe that for around $1100 you can get a laptop with such features. 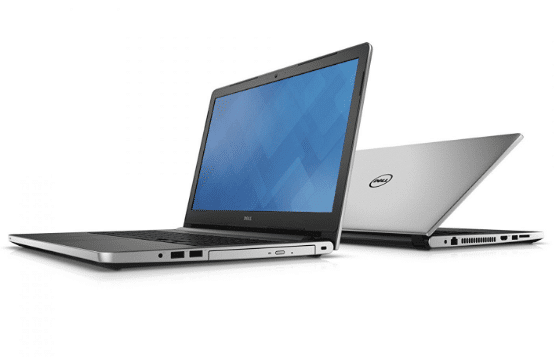 First, Dell G5587-7866BLK-PUS features 8th Generation Intel i7 processor. This is the latest processor and has some great improvement from the earlier versions. Probably what excites us most is that it’s a 6-core laptop. This is a great deal considering that i7 4-core laptops are great for music production. With up to 3.9GHz w/Turbo Boost processor speed this will allow you to load software and allow multi-editing. Apart from 6-core processor, it has a 16 GB DDR4 RAM and you can upgrade it to 32 GB. We don’t think there is any need of upgrading as 16GB RAM is enough for medium music production needs. Another feature we love is the 128 GB Flash Memory Solid State and 1TB, 5400 RPM HD provided. We recommend using the flash memory as the boot drive and storing everything else in the 1TB HDD. It has a great real estate of 1920 x 1080 15.6 inches screen with full HD display. The NVIDIA GeForce GTX 1050 Ti graphics card makes it great for video editing and gaming. The GTX 1050 is a special version graphics card. It’s powered by NVIDIA Pascal probably one of the most advanced GPU architectures on the market. Probably the only downside with this laptop is the 128GB flash memory solid state, we wish it was higher. But considering this laptop comes with the latest 8th generation i7 processor and 1TB HDD, it’s a fair compromise. We also love Dell G5587-7866BLK-PUS versatility. Apart from producing music, it can also serve as a gaming laptop, video editing laptop and also great for programming students. Its other features include; 802.11A wireless compatibility, optimal cooling capabilities, 3 USB 3.0 Ports, no optical drive, and 1 Lithium ion battery. If you’re on tight budget this is our recommendation. 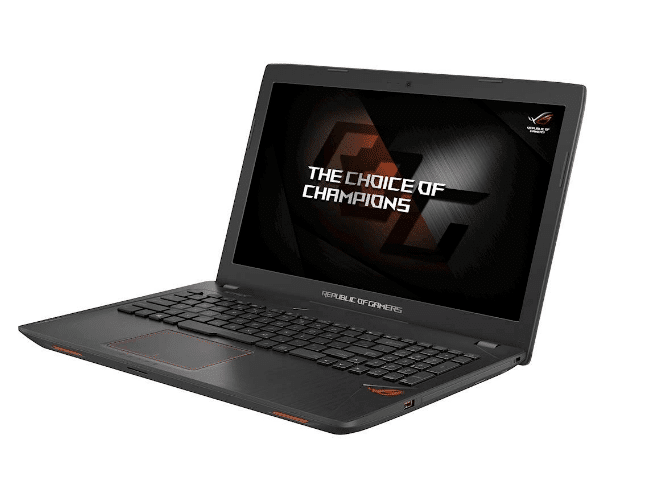 If you are looking for the best Asus music producers, ASUS ROG STRIX GL533VD or ASUS ROG Strix GL553VE gaming laptops are our recommendations. The VD features quad-core 3.8 GHz intel i7 processor, 16GB of RAM, and a 1TB HDD. While the VE stands out for the 256 GB SSD including all the features of the VD. If you are looking for a laptop that is good for music production as it is for gaming, this will be a smart option. Most acclaimed in the gaming world, this machine’s configurations make it a perfect bet if you have a little over 1 grand to spend on a good laptop for music studio. Asus is a China-based computer hardware and electronics manufacturer situated in Taiwan. This company was established in 1989 by 4 hardware engineers who were former Acer employees. It derives its name from a mythological Greek horse, Pegasus, which is linked with wisdom. Asus isn’t only known for its laptops but music production workstations, tablet PCs, motherboards, and desktops amongst other products. Its 4gb RAM is a great feature that allows you to run several programs without experiencing freezes or delays. Obviously, you can go as high as your music production demands in the RAM department. Its 15.6’’ Full HD panel will ensure that there’s great consistency in color and contrast as you work on your projects. It also offers up to 178 viewing angles with extreme clarity and no color shift whatsoever. What makes this screen even better is its matte finish that eliminates all glare and reflections no matter where you’re doing your thing. Are you a DJ or do you find yourself editing, recording, or mixing away from your studio? GL553VD packs lots of great features for you. Its ROG Aura RGB lighting keyboard accentuates its sleek design while also allowing you to have a clear view of all the keys on your keyboard regardless of the light intensity. This machine is also lightweight at 5.5lbs and has a slim build that won’t demand much space. Asus GL553VD is a true tank in this. Its 1TB (Terabyte) HDD is all you need to store your tracks, mixes, and anything else in your line of music production. This HDD makes over 7,200 RPM (Rotations Per Minute) that ensures speedy files transfers and loading. If you need more speed, you can opt for a similar model with a SATA3 SSD alongside the 1TB HDD, of course, at a slightly higher price. ASUS ROG Strix GL553VD’s extensive connectivity again makes it a great deal. Besides its Bluetooth 4.0, you’ll also benefit from 2 USB 3.0 ports, 1 USB 2.0 port, 1 RJ45 LAN port, and an HDMI port- almost all the connections that you require for flawless music production. We have nothing against ASUS ROG Strix GL553VD. We highly recommend it for professionals as well as newbies who have enough to spend on a great music computer. It’s light, has excellent speed, large RAM, unique graphics, and enormous storage space. From all perspectives, this is a great laptop for any recording artist. If you are in love with music, you must be the person who seeks out the best hardware for their work. Dell XPS 13-Inch just landed us one such laptop. It is a laptop devised for all your production needs. Starting with the sleek exterior look, you can take it to the studio and Djing gigs with no hassle. Dell shapes the technology world using innovative designs. It started in 1984 by 19-year old Michael Dell as PC’s Limited. Today, the Dell influence is felt as they delve in providing the best technological solutions to the worldwide market. The Dell XPS 13 excels in meeting their mission statement. It has a sharp display which is virtually borderless, so you get the full 13-inches to place different projects side by side. It enjoys a thin bezel which frees much of the screen space to squeeze 13 inches of screen size in an 11-inch frame. 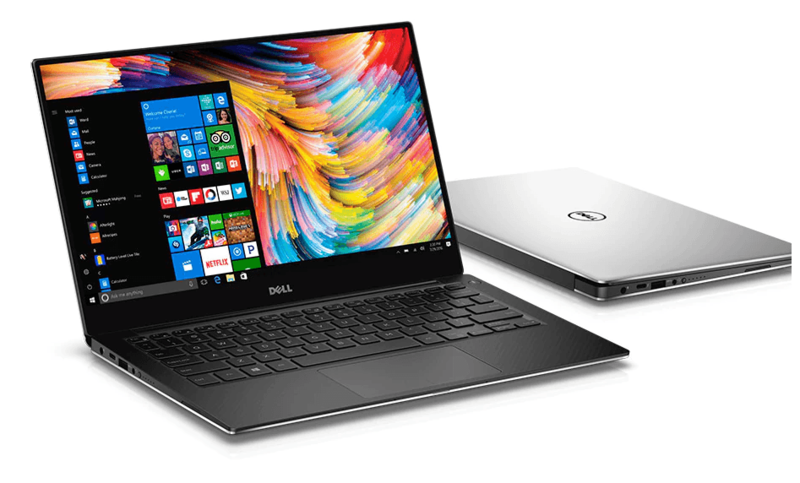 There’s everything to like on the Dell XPS13. It is furnished with the latest technology to give modern music production a new touch. The 7th Generation Intel Core i5 processor refines the speed of this laptop since you are not about to experience any delays when running multiple programs. It has four cores to take multitasking speeds to whole new levels. Regarding the applications you’ll be running, this laptop can preserve battery life from 22hours with common office software to around 13hours with advanced uses. The display as we said is jaw-dropping. With the stunning 3200x1800 resolution and UltraSharp QHD, you get to see eye-popping details for all your mix videos. It carries a 170-degree viewing angle on the IGZO IPS panel. This means from whichever position this laptop is placed; you can have a clear view of the screen. Do you DJ on bright sunny days? Well, with the 400-nit brightness, the screen remains visible even under the sun. See images for what they are with 1000:1 contrast ratio and color gamut of 72%. Not to mention, it has an optional touchscreen where you get to swipe away on a friendly screen. The keyboard is backlit so you can use it in music concerts with low lighting. The chassis is a single cut from aluminum, and the palm rest is from carbon fiber. The touchscreen is from Corning Gorilla Glass NBT which is scratch resistant. It preserves an elegant design, and you get to choose between silver or rose gold. This is a plush laptop with a steep price tag, but you can already tell why. The features are what we call near perfect since it excels from every angle. The display is top-notch with borderless edges and a bright screen. Take it to outdoor and night concerts and enjoy speed, mobility, and durability. This is our recommendation for the best laptop for Djing and music production. 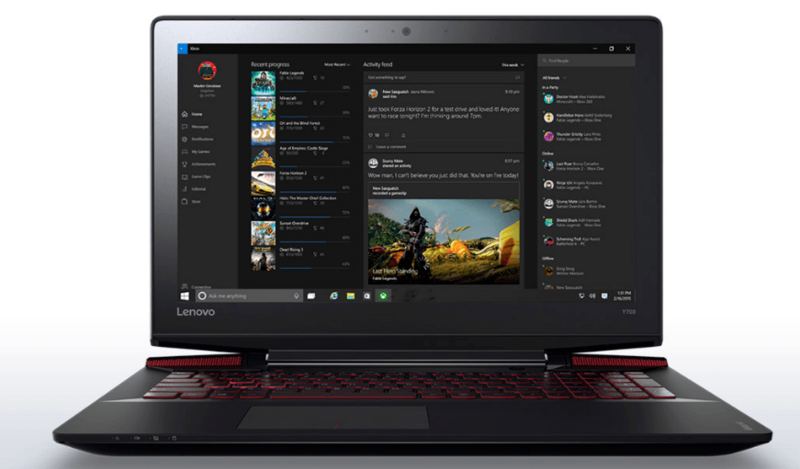 There are very few laptops that cost around $1000 with Lenovo Y700 specifications. This laptop has Intel Core i7 processor, 2.6GHz (3.5GHz w/ Turbo Boost). For RAM you have an option of either 8GB or 16GB. All the versions have storage of 1TB. These features make this laptop our pick for a budget friendly music production, djying and gaming laptop. If you’re more into pricey gadgets, Lenovo Y700 is all yours. This model is in the same league with ASUS ROG Strix GL553VD- our first contender in this list- in terms of price and functionality. Lenovo Y700 is a common name in professional music studio due to its reputable effectiveness resulting from its amazing specs. First things first: if gaming is in your blood, do know that this laptop was purposely designed for gamers like you but was later adopted by the musicians. True, it’s pricey. However, its stunning graphics backed by the incredible sounds from JBL and Dolby Audio Premium sound systems are all you need to lose yourself in your music production studio. It’s also lightweight at around 5.7 pounds if you’re to take your music experience with you. Lenovo Y700 ships pre-installed with Windows 10 which is easily compatible with several DAWs including Logic Pro, Ableton, and Cubase. Its engine is 2.6GHz Intel Core i7 backed by an 8GB RAM. What makes this laptop worth every penny is its enormous 1TB HDD storage space plus an additional 128GB SSD which should save you a few hundred bucks. Even better, its 15.6’’ display is LED-lit and designed to minimize all glare. Another great feature with this studio computer is its onboard Ideapad thermal fans which keep the system cool when you get serious on your music programs. It also flaunts Lenovo Energy Management software which aids in boosting battery life. The Apple MacBook Pro with TouchBar comes off as a luxurious choice but will give the Windows laptops a run for their money. It has an overly brilliant display with powerful speakers. The SSD is super fast and is faster than current Windows PC. 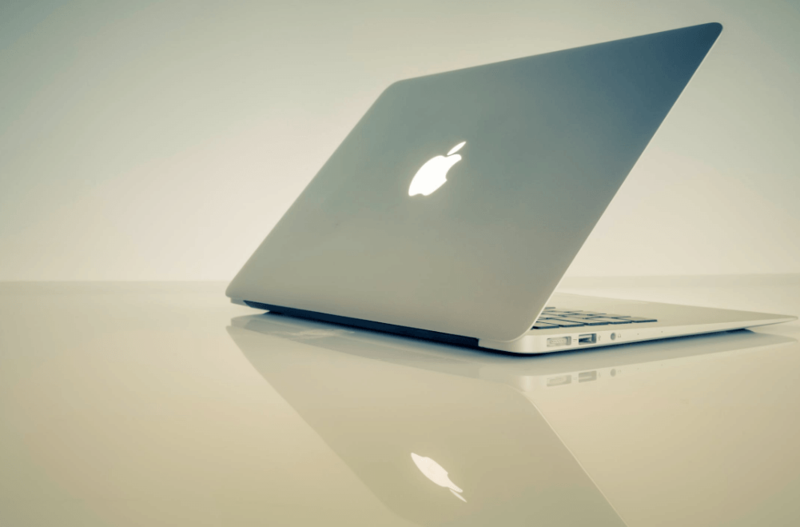 The Apple Company is synonymous with giving their Mac laptops a genius touch. With over forty years of designing, developing, and selling computer software, consumer electronics, and online services, Apple gives what they know are refined products. A bright display on a laptop makes music production more enjoyable. You even feel the creativity coming along if the machine is in sync with your thoughts. The premium look in this device starts with the grey Apple-inspired exterior. It has a full-sized keyboard making it super easy to feed keys and notes with ease. 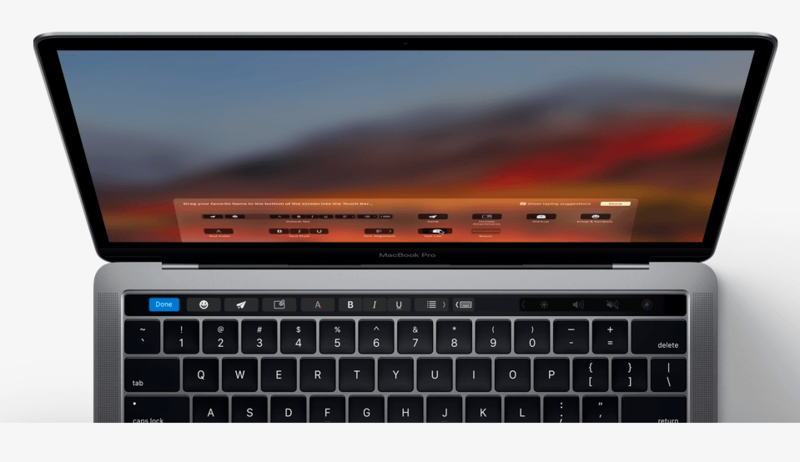 The touch bar gives a superior input experience since you can still use it as the unlocking security feature. With the 458nits of brightness, it doesn’t matter where the music takes you. It lets you see the screen while controlling various interfaces. The fast SSD, RAM, Core Audio, CPU Power, and battery power all work hand in hand to support your music production demands. It has 2X Thunderbolt 3, USB ports, and a 3.5mm headset jack. If you are just connecting two audio interfaces and a MIDI controller, you will not need an extra dongle for connectivity. The Thunderbolt 3 can send huge amounts of data up to 40GB/sec such that you can connect monitors directly. The 7th Generation Intel Core i5 and 8GB of RAM is great for multitasking. It does not experience any lags while running multiple production software. The SSD lets you store many samples giving you the flexibility where you can check in later and refine the sound. The speakers are kicked up a notch such that if you want to make recordings and listen to the audio, you’ll undoubtedly get clear vocals with strong bass, and accurate synths. We love the battery life it offers at around 9hours with moderate usage. It’s good but not the best when compared to other Windows PCs competing with it. You may not want to leave the power cable when taking on road trip concerts, but for around the home recording, you can take it to the studio without worrying it will cut short your recordings. This 2017 Mac Pro model is much better than what we saw in the last year’s 13inch design. It comes with blistering speeds, ample storage, and Thunderbolt 3ports. The screen display gives catchy effects plus the brightness allows using the laptop in super bright conditions. The speakers also have impressive audio. With 13inches of screen size, it is slim and gives a clear balance of usability and portability. This is our recommendation for the best laptop for Djs and music production for MacBook lovers. With 8GB RAM, 2.7 GHz i5 Intel Processor and up to 256 GB PCIe-based flash storage, MacBook Air is another great option for music producers. Note that all MacBook Air models have no retina display. This list wouldn’t have been complete without a slot for this MacBook Air because of one very simple reason; these models are currently the best-selling in the music industry. Ask any professional music producer or check out what your favorite DJ uses. The chances are that it’s a Mac. Mac personal computers are amongst the most reputed gadgets in Apple’s line of products. Apple is USA-based Company situated in California. It’s currently the world’s leading manufacturer of information technology by revenue and comes second after Samsung in mobile phone manufacturing. So, what’s up with this MacBook Air? To start us off, this model is amongst the slimmest at 10.5 x 2.2 x 14.2 inches and also the sleekest we have on this list. It’s also the lightest Mac computer in this category at around 3 pounds. Needless to say, this MacBook Air operates on Mac OS X operating system and is fitted with a 1.6GHz Core i5 processor from Intel. Notably, it also features a turbo booster that takes this speed as high as 2.7GHz. It also has an 8GB LPDDR3 RAM and 128GB SSD. As expected this laptop offers flat-out performance in about any music production task that comes its way. Another reason why we recommend this model is its Intel HD Graphics 6000 coprocessor that offers crisp and vibrant images and videos for professional editing. Moreover, this Apple music production computer offers best battery life with a promise of up to 12 hours (this will depend on how you use your comp, though). Its screen is 13.3’’ which is slightly smaller than most of the other models here and has a resolution of 1440 x 900. The display is a bit smaller, 13.3"
If you are looking for the best HP laptop for music recording, we have 2 recommendations. HP 15-ay018nr and HP - Spectre x360. Featuring Intel Core i7, 8GB Memory, and 256GB Solid State Drive, HP - Spectre x360 is a smart choice for audio production. Most of us have probably heard about HP- Hewlett Packard. It’s very likely that the first laptop, desktop, or printer that you interacted with was an HP. This is a California-based company that has been the leader in PC business for a few decades until Lenovo took over after merging with other brands including IBM. HP is synonymous with quality, and this 15-ay018nr laptop doesn’t shy away from this. It’s a bit pricier than several other laptops here but still way below the 700 dollar mark. If you are looking for one of the best HP laptop for music production, this is our recommendation. As you’ll soon find out, HP 15-ay018nr is loaded with impressive next-generation features to make your music recording and editing smoother and enjoyable. To begin with, HP understands that speed and reliability is critical in your music production. As such, you get a laptop fitted with Intel’s Core i7 2.5GHz processor and a large 8GB RAM. That’s not all. Your bucks are also enough to get you a 256GB SSD storage which will boost your computer’s disk reading and writing speeds. On this note too, do know that this machine comes with a built-in DVD writer. This feature backed by HP’s reputable batteries will make on-site music recording quite a breeze. Did I mention that this is the lightest Windows laptop we have on this list at 4.8 pounds? 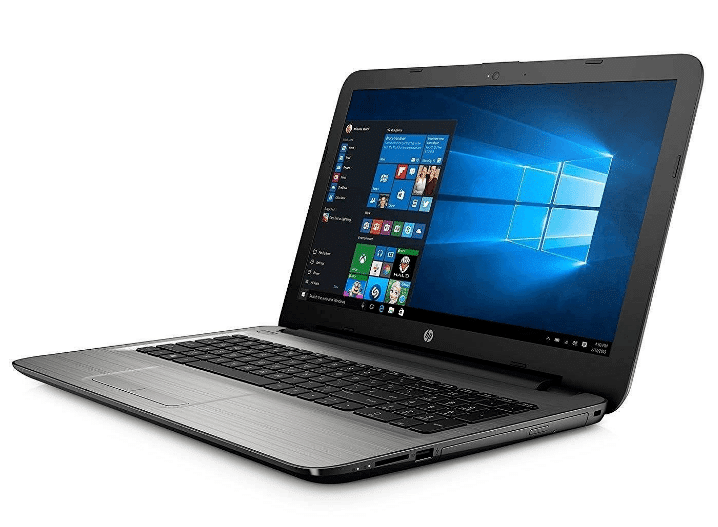 HP 15-ay018nr again brings a 15.6-inch screen with 1920 x 1080 pixels resolution for crisp and vibrant colors for video editing experience. There’s so much to say about this model simply because it never disappoints. HP stresses that each unit goes through 200 thorough tests to ensure that it never fails you. If you found GL553VD a bit on the pricey side, Toshiba has a budget-friendly option with almost all the features in GL553VD and some even better. Toshiba is a Tokyo, Japan-based well-known manufacturer in the field of computers and electronic components. It was founded in 1875 and is well-rooted in most continents around the globe. It’s over 130 years of computer hardware experience is a substantial reason to consider it if you’re in need of an affordable studio laptop. 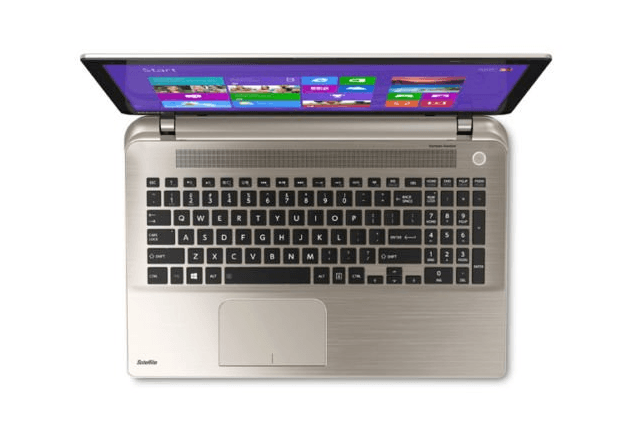 Toshiba Satellite S55-B5280 is a reliable option for beginners and students who want convenient music production and editing laptop without spending over $1000. This power-packed machine comes pre-installed with Windows 8.1 that you can later upgrade to a version of your choice. It also features the 4th generation 2.0 GHz Core i7 processor which is a great deal for its price tag. Its speedy i7 dual core processor is boosted by the presence of a 12-GB DDR3L RAM which eliminates all blue screens and hanging as you track and edit your sounds on several multi-tasking programs. Like the pricey Asus above, Toshiba Satellite S55-B5280 also flaunts 1TB worth of storage space. It also has a 15.6-inch TruBrite and LED Backlit screen with 1366x768 HD resolutions. This laptop’s webcam with Ultra HD output capabilities is an added advantage if you are Youtube or video-chatting enthusiast. This device is also lightweight at around 4.8 pounds and can, therefore, be effortlessly ferried to the music production site. It also has USB 3.0 ports, Bluetooth 4.0, and Media Card Reader connectivity for greater convenience. If you’re on a tight budget and need a machine with near-perfect features for incredible music producing, Toshiba Satellite S55-B5280 is all yours. Its 1TB will cut the cost of having to purchase an external HDD while its LED-backlit display makes it easy to work on your tracks and mixes both day and night. However, be informed that its battery- which holds power for a pretty good time, by the way- isn’t user-replaceable. You’ll, therefore, have to learn how to take care of it. One thing that attracted us to this Acer Aspire is its excellent build. We were also amazed by its musician-friendly price tag on Amazon which was almost 23% cheaper than what other dealers were offering it at. It brings highly innovative features that make music editing and recording super easy, enjoyable, and fun. This isn’t much of a surprise considering that Acer has been in this business for over 40 years now. This is Taiwan-based computer Hardware Company that deals in computers, Smartphones, tablets, and PCs. Notably, this company was rated the 6th best computer vendor in late 2015- this should wash away all your doubts about dealing with them. The most easily noticeable feature in this piece is its 17.3’’ ultra wide screen. Amazingly, the display is LED-backlit and offers full HD (1920x1080) effect. 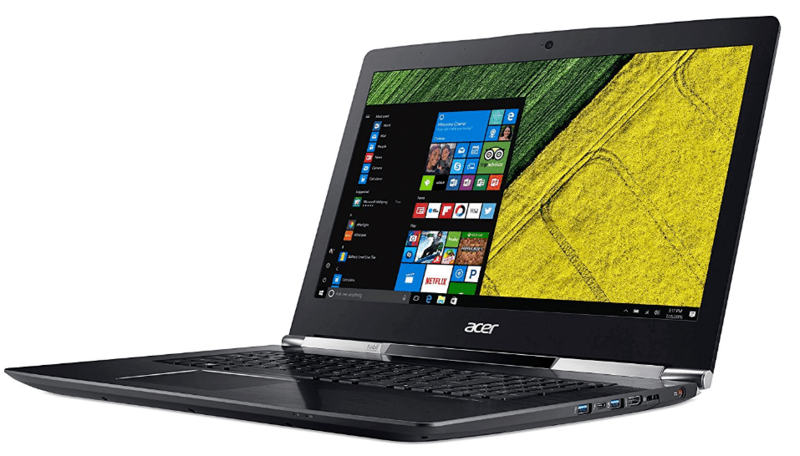 As such, Acer Aspire V17 can be confidently treated as amongst the best Deejaying laptops for 2017. Digging deeper into its specs, you find a 2.6GHz quad Core i7 processor from Intel’s latest 6th Generation. This engine also boasts Turbo Boost Technology that takes your speeds up to 3.5GHz. You also find a 4GB GDDR5 RAM for flawless multi-tasking and a 1TB HDD for all your music files. Acer Aspire V17’s dedicated sound system with 4 state-of-the –art stereo speakers will again take your music editing- gaming and movie watching too- to a whole new level. This music laptop also offers an important addition that Toshiba Satellite S55-B5280 lacked; 8X DVD Drive. Sometimes good things come cheap, and this model perfectly fits in this category. 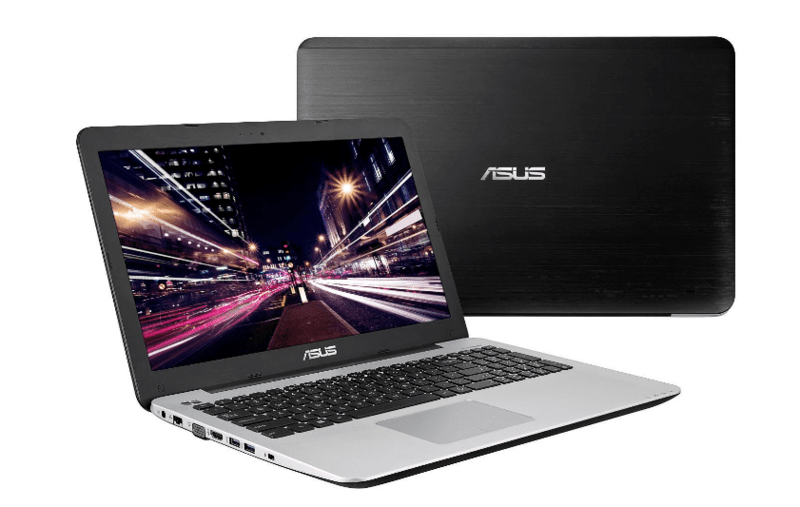 Asus F555LA-AB31 costs way less than 500 bucks on Amazon. I hate calling it cheap especially after considering the exclusive Asus apps at your disposal and incredible specs herein. This machine’s 5th Generation 2.2GHz i5 processor and Asus’s IceCool technology are its strongholds. Its lightning speed response backed by its powerful hardware ranks it highly on any list of cheap music editing and production computers. Asus F555LA-AB31 boasts a 4GB DDR3 RAM and 500GB Hard Disk for your data storage purposes. Notably, this high-quality studio laptop comes fitted with Windows 10 which is quite familiar to most users. Uniquely, you also get a digital assistant with the Windows 10 and one of the latest, super fast browsers. This laptop also brings 2 USB 3.0 ports which are known to be almost 10x faster than their USB 2.0 counterparts. You also get 1 USB 2.0 ports and HDMI and VGA ports. Moreover, you won’t be spending extra bucks on an external DVD player since your Asus F555LA-AB31 has it already. For Skype and video conferencing lovers, this laptops 15.6’’ matte display and high-sensitivity HD camera have your back. It’s also worth noting that this is a beautiful-looking machine- just in case that was on your list of musts. It has a decent and up-to-date design with a non-smudge and fingerprint-resistant finish. Its subtle concentric circles on its body make it easy to grab on your hands without the risk of it sliding off. The Lenovo ThinkPad Edge E560 is another reliable option with about all the required specs for a good music production computer. This machine comes from the world’s largest personal computer manufacturer- Lenovo- headquartered in China and USA. This company currently has its foot in over 60 countries worldwide and sells its products in close to 160 countries. ThinkPad brand is now under Lenovo since the entire IBM personal computer division was acquired in 2005. So, don’t be surprised to find the brand names Lenovo and ThinkPad in a single product. This ThinkPad Edge E560 music workstation laptop is available at a little over 500 bucks. It comes with Windows 7 pre-installed plus a free license to upgrade to Windows 10 Professional version. If you think that the price is awesome, wait until you find out the great deal in its specs. 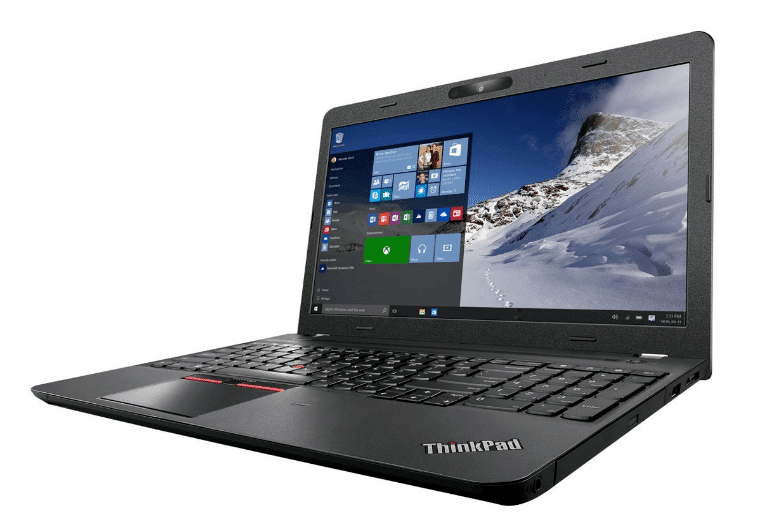 ThinkPad Edge E560 boasts Intel’s latest 6th generation i5 2.3GHz processor and an upgraded 8GB DDR3 RAM. This is good news especially if you’re planning to run excessive plug-ins and programs in your music recording, editing, mixing, and producing purposes. The machine also has a 500-GB HDD with 7200rpm which is a great improvement from Asus F555LA-AB31’s 5400rpm. Another advantage of this model is its fingerprint reader which gives it a more serious design compared to other studio computers on this list. Its 15.6’’ anti-glare screen is enough to allow you to multitask while the 6-cell battery will keep it powered for long. For connectivity, ThinkPad Edge E560 brings 3 USB 3.0 ports, 1 VGA video port 1 HDMI port, 1 4-in-1 card reader port and an HDMI port. For those who “Made in the USA” matters so much to them- which is good- I give you Dell Inspiron Flagship. Dell is an American manufacturer, dealer, and vendor in personal computers, data storage devices, servers, cameras, mp3, and numerous other computer peripherals. This company is named after its founder (Dell) and is situated in Round Rock, Texas. Dell is a well-known hitter when it comes to computer quality. Simply put, they know their thing and seem to understand what you need in a good music production computer. As such, Dell Inspiron Flagship is a reliable bet for a music producer seeking for a quality entry-level laptop below 500 dollars. This machine comes ready to use, thanks to the Windows 10 already installed. It also boasts feasible internal features including 2.5GHz Intel Core i5 processor alongside AMD Radeon R5 M335 graphics co-processor for breathtaking videos and gaming. The screen measures 15.6’’ and has a maximum resolution of 1920 x 1080. Another feature worth celebrating is its 1TB 5400rpm HDD which is quite hard to find in a laptop at this price range. You also get an 8GB DDR3 SDRAM RAM which is quite large enough for heavy duty music production software and programs. The only thing that didn’t sound well is the absence of USB 3.0. This laptop is fitted with only 2 USB 2.0 ports which may necessitate the need for a USB port hub. And there we have it, out picks for the best laptops for music recording for 2018. We hope you got one that will meet your demands. What does getting the best laptop for music production mean to you as a music producer? You can run multiple applications and music programs without freezing. 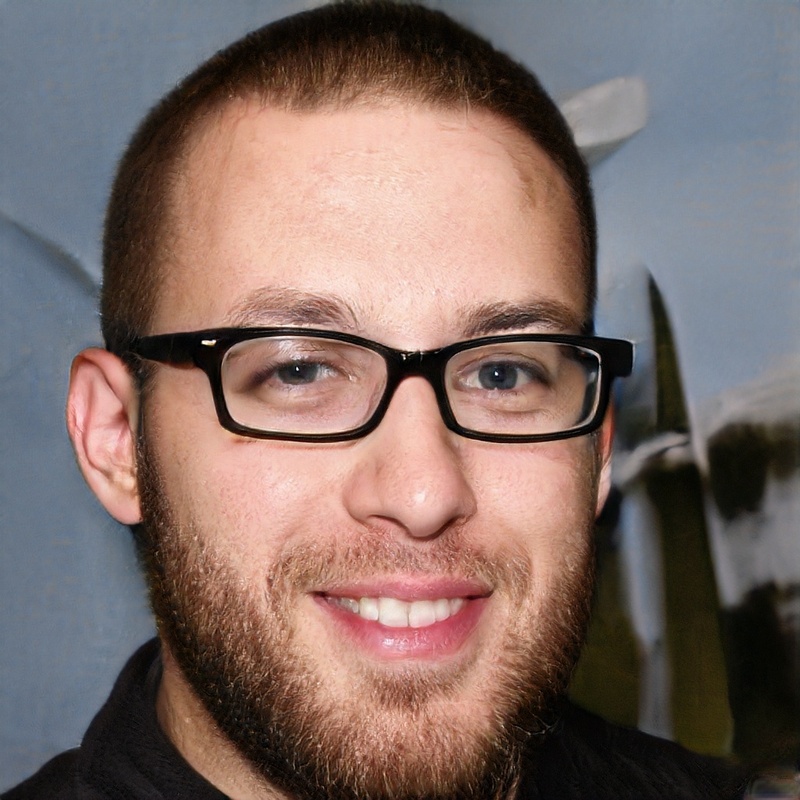 Applications take seconds to load and have little or no software compatibility issues. No annoying pops and clicks when recording or distorted recordings and latency. Enough space to store all your project files, software, samples and everything else you need. Can run even the most demanding music recording software like Pro Tools. You can do a whole wide range of things with it, from gaming, video production, graphic design, djying to programming. I hope this emphasizes enough how important it is to invest in the best laptop whether it’s a Windows PC or MacBook. What to consider when buying a music production PC/Laptop? The best starting point when choosing a music production laptop is identifying your preferred DAW software. This is because there are specific DAW software that have specific requirements. If you want more convenience when in studio or when travelling get a tablet. Here are 2 tablets that you can use in producing music. Our picks for the best tablets for music production include Microsoft Surface Pro 4 with 128 GB Space and 4 GB RAM (tablet to laptop in a snap) and Lenovo Yoga Book Tablet. ‘’What are the best Windows and Apple laptops for music producers in 2018?’’ Google will surprise you by the number of people asking this question each day. Well, this confirms that we are past those days when music production and recording was a thing for specialized studios. Just a few decades ago, the hobby of expressing ideas through music was reserved for those with high profile sound engineering hardware. But those days are gone. Today, a keyboard, a pair of studio monitors or headphones, and a reliable mic in your room are all you need to get going. On this note, check out our comprehensive lists of the best studio monitors and best studio headphones that you shouldn’t lack in your studio by now. Whether you operate an analog, digital, or hybrid studio setup, most of your major undertakings will revolve around your music producing computer. These machines have revolutionized modern day’s music recording, mixing, editing, and producing which would have been pretty expensive if you chose to do it in a professional recording studio. They're also multipurpose, you can use them to edit music videos and if you've a YouTube channel a laptop is essential. Now, identifying the ideal laptop for your studio is tricky. Like any other recording gear, there are tons and tons of features to look out for. Truth be told, it only takes a tech savvy to identify best of the best laptops for any task. The market today has a vast majority of computers. They are quite confusing and you may either go home empty handed or fall for the wrong machine. However, choosing a good laptop can also be quite a breeze. How? I’m glad you asked. The most important thing to understand is the ﻿﻿﻿﻿﻿﻿﻿﻿﻿﻿﻿s﻿﻿﻿﻿﻿﻿pecs and little basics﻿﻿ about them. The type or brand plays no big role in your studio experiences… just learn what specs fit your needs then identify the brand that offers that…SIMPLE. There exists a vast gray matter over which is best between these 2. There are lots of arguments going around with most tech savvies arguing that Mac is more reliable and stable while Windows is only an option if you’re on budget. However, do know that this most acclaimed Mac also has its share of hiccups. On the other hand, Window is quite user-friendly and less expensive. Simply put, there isn’t any brand that’s purely dedicated to music production. Whether you’ll go for Mac or PC is determined by the points below. A digital audio workstation refers to computer software/program specifically devoted to multiple digital audio recording, editing, and playing. Now, the recording software is the key determiner on whether you’ll go for a Mac or PC model. This is because some, for instance, Apple Garageband and MOTU are Mac-only while others like Ardour are compatible on both Mac and Windows. Uniquely, PCs allow you to run several DAWs on a single version of Windows unlike in Mac where you may be forced to change the OS X version to run different software and hardware. So, if you are looking for the best laptop for fl studio, any of our windows laptops reviewed above will get the job done. The processor speed determines how fast your applications will run on your computer. You need to be more careful on this since you won’t be able to upgrade it later. A faster processor is always welcome since it’ll allow you to do heavy tracking as well as run several plug-ins, VSTs, and applications simultaneously. Processing speeds are measured in Hertz (Hz). Most computers today offer MHz (megahertz) or GHz (gigahertz) super-speeds. Remember, the faster, the better. If you need satisfaction, go for processors with over 2.0 GHz. Another way of determining how fast a PC is by identifying how large the processor is. This is indicated in about any computer’s specs sheet as Core i3, i5, or i7. i3 machines are inexpensive but a bit slower. Going a notch higher, i5 are mid-range level computers which are slightly pricier than i3s but, of course, faster. You can rely on these for your music laptop. If you still have some cash to upgrade your studio to professional level, a Core i7 laptop with its supersonic speeds will take you there. However, be ready to pay for this luxury. This refers to the amount of space available for your machine to handle the software and be able to run various applications without slowing down/Freezing. Music production laptops shouldn’t have anything less than 8 GB of RAM. The good news is that it can be upgraded to suit your needs. Most laptops today come with built-in HDDs with over 500GB of storage space. You may also opt to attach an external HDD via a USB cable if your computer’s original space isn’t enough and to prevent loss of data too. Notably, professional music producers and recorders prefer SSDs today. Though both the HDD and SDD have virtually similar functionalities, SSDs are known for their fast writing speeds. You may require this for heavy and numerous files transfers. A few laptops have the SSD onboard. However, be informed that SSDs offer minimal storage space. They are also darn expensive! This goes without saying. The size of your studio recording and producing computer also matters a big deal. This, however, depends on what you’ll be doing. A model with at least 12’’ may be enough if all you need is an ultra-portable laptop for on-location recording and simple files transfers. For heavy production work, tracking, editing, and arranging, opt for 15’’ screen and above. In fact, 17’’ models look more serious- if you have extra bucks to spend, though. Most importantly, ensure that your computer of choice has enough ports to let you connect equipment like a USB mic. Ensure that you get at least 1 or more USB 3.0. However, this shouldn’t be more of a worry since you can always bring a USB hub onboard to save the situation. Most audio recording laptops have a higher battery life of up to 12 hours. However, it’s common sense that this will be affected by the programs you run on your machine. If you’re doing your thing near a power socket, keeping the computer plugged in is the best idea. For on-the-road use, go for a model with a longer battery life. Can you use FL Studio on Mac? Or Logic Pro on Windows laptop? What is better between Mac and Windows laptop when it comes to producing music? It’s 2018; provided a PC has the required specs it can get the job done. It’s just a matter of personal preference. However, if your DAW can only run on a specific OS you have no option. While you can build your own system remember it’s illegal to build a Hakintosh. What is the best laptop for music production? What matters in a music production PC? Where can you find reviews of laptops from music producers? While there are numerous places where you can find personal experiences of different people, Reddit, Amazon and music recording forums are some of the best places. Is MacBook better than Windows laptop when it comes to music recording and production? For the last decade MacBooks were the most popular music making laptops. In a way, it looked as if you must have a Mac to be taken serious. But things have changed. Today, its all about preference. There are many Windows laptops that are good for music recording and production. As long as the laptop has the right features it will do the job.